The American Chemistry Council (ACC) projects that production of commodity chemicals will grow by 4.9% in 2017. Growth is forecast to increase YoY by 6.3% in 2018. Exports will play a large role in expanding production, led by bulk petrochemicals and organics as well as plastic resins. There will be strength in the production of inorganic chemicals, synthetic rubbers and manufactured fibers as well. In Europe, where the industry has been under pressure from increased globalization and the high cost of doing business, the European Chemical Industry Council (Cefic) is predicting a small uptick in overall chemical production in 2017. Undoubtedly, the US and Europe face some strong headwinds in the shape of competition from Asia Pacific (which accounts for more than 50% of the market). Yet, as chemical production continues to rise, there is a real opportunity for executives to maintain and increase their global market share. The landscape for M&A in the chemicals industry is also shifting as the industry’s debt situation reaches an important stretch. With executives and shareholders across the industry actively looking at M&A opportunities to drive top and bottom-line expansion, it pays to be prepared. Preparation involves conducting pre-acquisition due diligence, helping break down the functional and cultural silos that hamper successful post-acquisition integration and assisting with centralization, synergy and cost reduction and strategic asset disposals. Maine Pointe has found that strategizing with senior management pre-merger has helped them to accelerate synergies. We can uncover supply chain and operations-oriented value creation opportunities that enable you to quantify EBITDA improvements, together with working capital risks and opportunities. Competitive edge is often based on know-how or production techniques that provide small but significant advantage for efficiency, yield and cost. 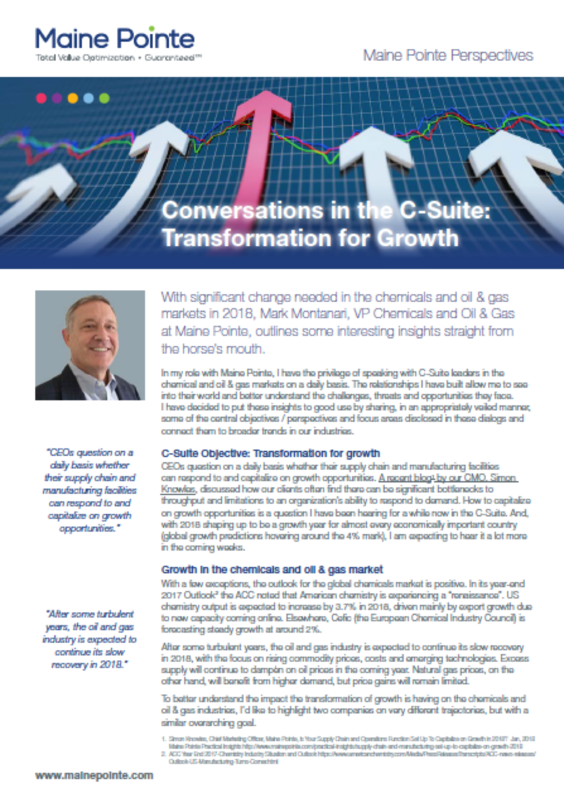 While many commodity chemical companies are taking steps to lower input costs to grow margins, they are tending toward a siloed cost-center-by-cost-center reduction. The most successful companies in the sector are those that have best-in-class performance across all functions, aligning supply chain strategies with operational strategies to embed a total value chain perspective. The world's largest potash producer and third largest producer of nitrogen and phosphate. A major integrated chlorovinyls manufacturer. Our hands-on implementation experts helped a major commodity chemicals company combine the businesses of two large companies into one multibillion-dollar entity. Maine Pointe's transformation project delivered over $100M in savings for the newly-formed organization.